Draft guard energy saver,offers double draft protection, keeps heat and air conditioning fromescaping. No installation, slide under door, fits all door types. Removable, washable cotton cover. With your help we can reach more people and let them know about Twin Draft Guard whether this product works or not. Great product reuse it every year. I have owned two Twin Draft Guards for a few years and they do a great job at draft protection. They are so simple to use and fit your door(s) exactly since they are long and you cut them down to fit your door. 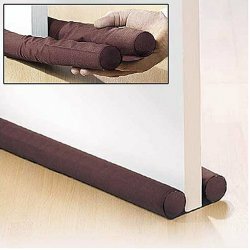 Takes only a few seconds to do so.I highly recommend this product if you have if have a gap between the bottom of the door and the floor, especially for outside doors.